walking this pretty planet of ours that doesn’t like Smores. Crisp graham crackers filled with gooey toasted marshmallow and dreamy melted chocolate…. Today I have a HEAVENLY cookie recipe that captures these wonderful flavors. everything tastes great added to cookie dough. Ok…perhaps asparagus shouldn’t be added to cookie dough. But a lovely toasted marshmallow? The two love each other dearly. 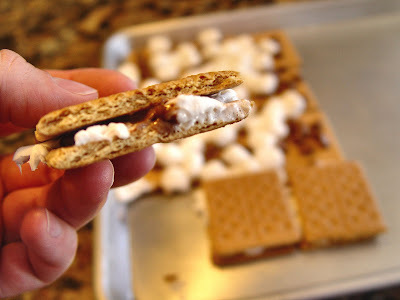 Now seeing that today is Wednesday and I have promised to post a fun kid lovin’ kitchen project each Wednesday this summer, I wanted to show you just how easy it is to make smores indoors! Of course smores are all the more heavenly with marshmallows toasted over a camp fire. But I don’t always have a campfire rip roaring outside my kitchen window. So we lay some graham crackers out on a cookie sheet and sprinkle them with chocolate chips. We cover the chocolate chips with marshmallows…. And toss the pan into 350 degree oven for about 5 minutes, or until the marshmallows have puffed up nicely. Then place another graham cracker over the top, press the toasted marshmallows down and vwalla…there you have it. 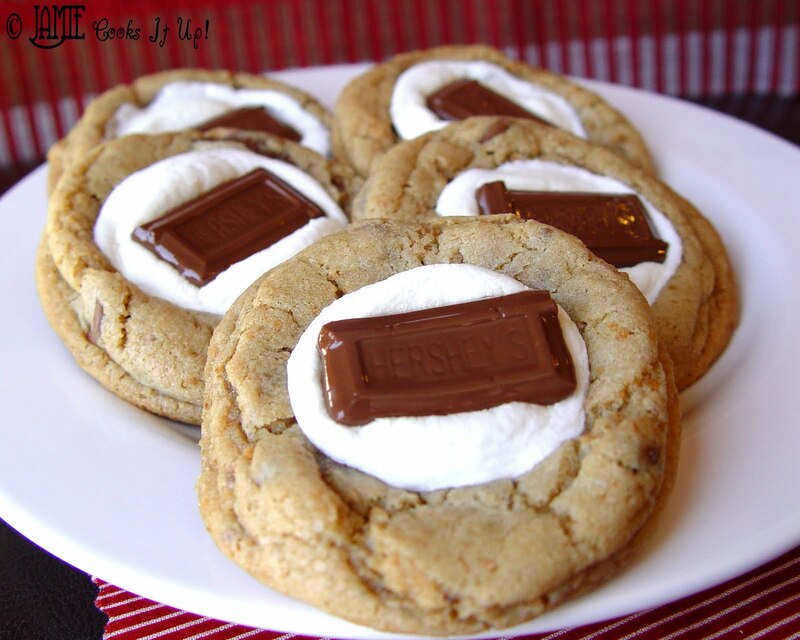 Now if you have a little more time in your schedule and would like to make some heavenly cookies of wonder and bliss…. I sure hope you will. 1. Break the graham cracker crumbs up into pieces. Place them in a small food processor and grind them into crumbs. No food processor? Do not dismay. You can crush your crackers into crumbs by placing them in a gallon sized zip loc bag, sealing the bag securely and then smashing the crumbs with a rolling pin. and a dash of salt. Let the food processor grind all of the ingredients together nicely. Set the crumbly mixture aside. 3. 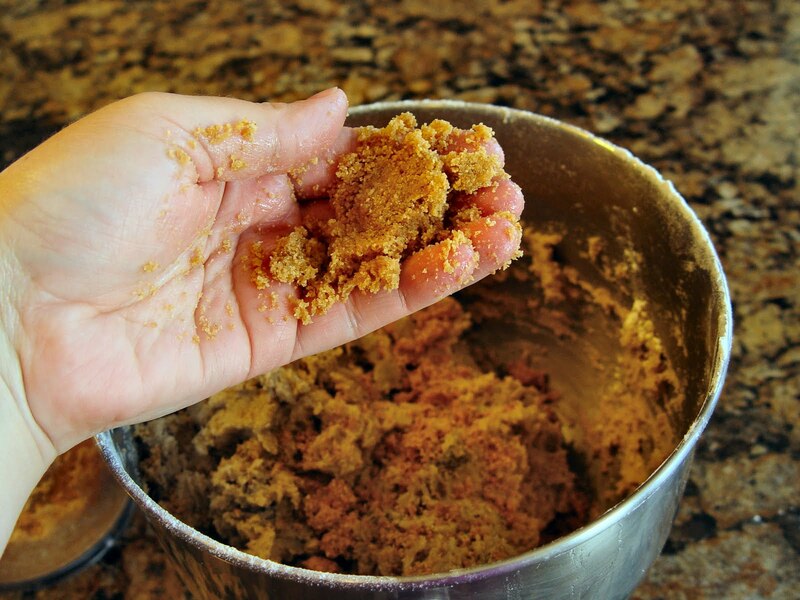 Place your softened butter and brown sugar into a large mixing bowl. Beat on medium speed until the ingredients are nicely creamed together, about 2 minutes. 4. Add your eggs, milk and vanilla and mix for another 2 minutes. 5. In a separate bowl combine your baking soda, baking powder, salt and flour. Add it to your creamed mixture and mix until combined. Toss in your chocolate chips and mix yet again, just until the chips are evenly distributed. 7. Roll the dough into 2 inch balls, place them on a lightly sprayed cookie sheet and bake at 350 for about 6 minutes, or just until the cookies begin to crack. 8. While your cookies are in the oven, cut the large marshmallows in half. 9. 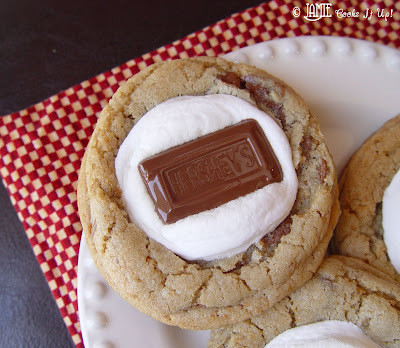 Press a marshmallow piece into the center of each hot cookie. Return the sheet to the oven and bake for about 1 1/2 more minutes allowing the marshmallows to puff up and get all wonderful and delicious. 10. Remove the sheet from the oven. Let the cookies sit for about 2 minutes, then press one Hershey bar piece into the center of the marshmallow. 11. Remove the cookies from the sheet and allow them to finish cooling on a wire rack. yum yum yum! I told my husband last night I wanted marshmallows, now I know why! I love smores and he has NEVER had one! Crazy I know. I'm just going to have to go get the supplies and make these puppies for us. I have a question- about how much in cups do you think the graham crackers smash up to? I have cracker crumbs and it would be a lot easier 🙂 Can't wait to make these!!! Oh dear, oh dear. I shouldn't have looked at this post. My early warning system tried to give me a chance to avoid danger, but of course I didn't listen. Now I'm stuck with visions of these amazing cookies in my head; soon to be in my belly, and shortly thereafter on my thighs. It just may possibly be the best thigh building session of my life! Are these cookies best eaten fresh out of the oven do you think? If you like smores try them with Rolos. Mmm! S'mores cookies look good! You know what I like to do for indoor s'mores? We sit around the dinning room table and roast our marshmallows over tealights dropped into cocao mugs! We just use a wooden skewer for our “sticks” and viola! Real, toasty golden s'mores on a rainy night in Washington! These look so good- s'mores without the need for a campfire! Perfect! THAT is totally brilliant. My kids would love it. Thanks for sharing the idea with us! You need about 1 1/2 C graham cracker crumbs. Good luck! Hope you love them! love love love. I'm not a huge fan of smores..but these took DELICIOUS! my girls will love helping me make these. thanks for sharing! WOW is all I can say. Had a cookie with coffee for breakfast. This is a keeper. Thanks for sharing!!!!! Love your blog…keep up the great work! I stumbled across your blog one day by chance and I am so glad I did! Your recipes are fantastic and your pictures are wonderful and very appealing. I have tried three of your recipes so far, including these smores cookies. Each one has been delicious and the best part is my kids like them! I look forward to new posts and also making more of your recipes. Thanks! Thanks Jamie! These were a hit at my YW Camp awards night! I made these the other night are they were awesome!!!!!!!! thanks for a great recipe!!!~! made these this afternoon and they were yummy…but i think i needed to cook the cookies a little longer the first time. i cooked them 6 minutes and feel they were still very doughy and never got firm. not that i mind eating the dough though…love it! Oh my gosh. Found these via Pinterest and decided to try them out. So very glad I did. Even El Hub who is very traditional about his cookies loved this one. Thank you for sharing! i too found that 6 minutes was not long enough. after adjusting the temperature and the time, i achieved the desired result. delicious and cute idea. These cookies are awesome. I made them for my sons Kindergarden class. They inhaled them. So good. I too found that 6 minutes wasn't enough. I did 8-10 minutes before putting the marshmallow on. I also put the chocolate in the freezer while the cookies were baking. My first bath I didn't and the chocolate got melty. I might use Hershey kisses the next time. Their will definetly be a next time.